The flame that led him to the delightful meadow. He was from Myra of Lycia from an illustrious and notable family, old and advanced in age. When he saw impiety flourishing and the religion of the idols was on the rise, and many were enslaved to its delusion, offering sacrifices to soulless images, the blessed one was moved by zeal, and he went in the midst of the idolaters, admonishing them to refrain from this delusion, and convert to the God believed in by the Christians, Who is the Creator of all that breathes, and the Giver of all life. 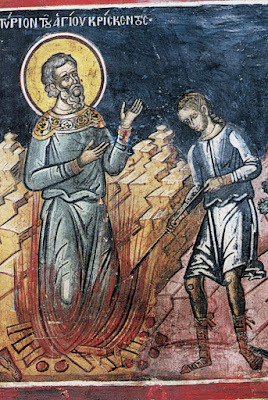 Because the governor called the Saint one who was possessed by demons and unfortunate, for he willingly wanted to endure torments, the Saint responded to him, saying: "Suffering for the sake of Christ brings success and happiness." When the governor asked him what his name was and that of his father, the Saint only gave one answer to his questions, namely: "I am a Christian." 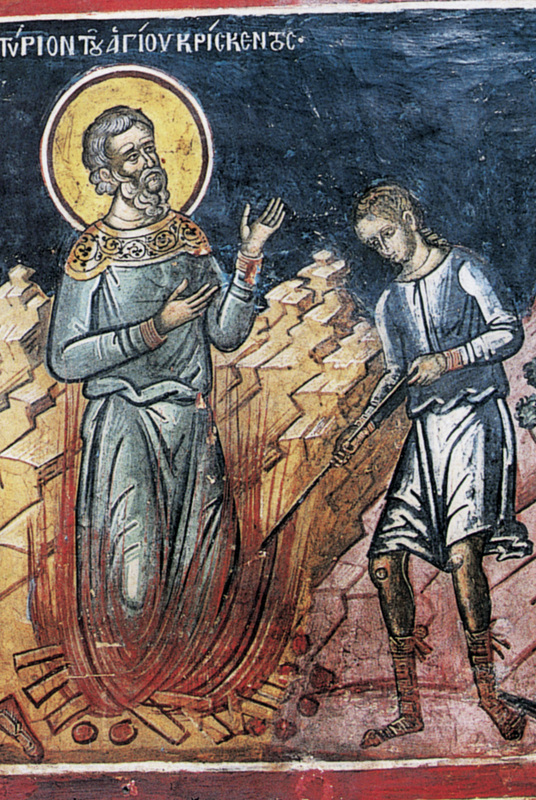 The governor then advised him to at least show respect towards the idols, but Crescens refused, so that he did not make it appear in the slightest that he was offering reverence to the idols, saying: "The body is not able to do anything of itself apart from the wants of the soul, since it is by the soul that the body moves and is governed."